By Melissa 4 Comments - The content of this website often contains affiliate links and I may be compensated if you buy through those links (at no cost to you!). Learn more about how we make money. Last edited January 5, 2018 . The 4th of July is almost here. One of the best ways to celebrate our nation’s freedom is to spend the day with family and friends and cap the evening with fireworks. While there are plenty of frugal activities to do at a party, you may think the food will be too expensive. If you are living on a tight budget or paying down debt as we are, you may think you cannot afford to host a party or have any frugal summer fun. As the host, you may supply the main meal such as the burgers and hot dogs. There are plenty of sales on these items this week, so you should be able to get these at a discount. 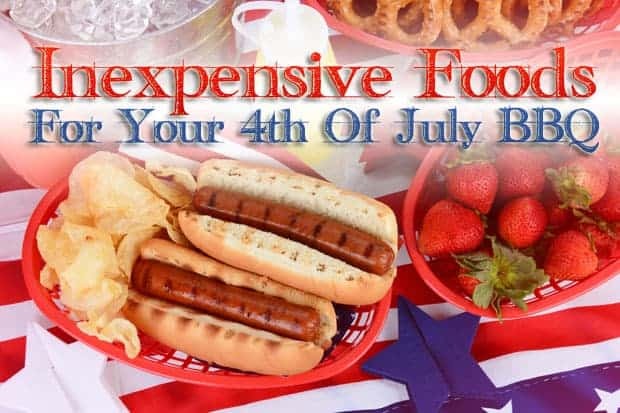 If you have a Costco or Sam’s Club membership, get hot dogs and hamburgers in bulk and save some serious cash. To avoid this, give your guests a category to choose from such as side dish, fruit, dessert, veggies, etc. Then, you can delegate what category everyone is bringing a dish from to ensure that you have a wide variety of foods for your guests to choose from. One easy way to split it up for a larger group is to assign a category of food based on the person's last name. For example, if the person's last name ends in A-F bring an appetizer, G-L bring salad, M-Z bring dessert. If too many people have the same last name (like when my family gets together), assign every family a number and assign each number to a different category. 1-5 bring an appetizer, 6-10 bring salad, 11-15 bring dessert. Iced tea: A large container of homemade iced tea only costs you the nominal price of a few tea bags, and it can be a refreshing drink on a hot summer day. Lemonade or other juice drinks: Buy frozen juice and make a few pitchers full of your favorite juices. You could even make a punch if you want, drop in a scoop of ice cream and some sprite, and you've got a delicious refreshing drink! Or buy juice that comes in colors of red, white and blue! Bring your own drinks: You could ask your guests to bring their own drinks, especially if you are supplying the rest of the meal. Or supply one option and if people want something else, ask them to bring it along. If you would like to supply all of the food, you can do so and still not break the budget. Szechuan Noodles with Chicken and Broccoli: I saw this on the Food Network, and it seems perfectly suited for hot weather. Have cool noodles, some chicken and broccoli in a tasty sauce. This would make an excellent dish at a barbecue, and it can feed a lot of people! Cheesy Salsa Dip: This makes a full slow cooker size and is a great appetizer. It is so addictive, your guests may likely fill up on this before the main meal. Best of all, it costs less than $10 to make. You can buy a 3 pound bag of nacho strips at Costco for $4. Fruit: Fruit is another refreshing summertime favorite. Instead of pricey fruits, choose inexpensive fruits like watermelon, cantaloupe, and honey dew that aren’t that expensive and stretch to feed many people. I even recently saw someone who made a cake out of fruit. Sounds strange, but it looked cute, and I bet it tasted great. Embrace Mexican Cuisine: Made right, beans and rice can be delicious and a filling side dish. A large container of salsa served with low cost tortillas is another good appetizer or side dish that most people like. Homemade enchiladas are another good way to stretch your food budget, and they taste delicious. Buy rotisserie chicken to fill the enchiladas or save even more by roasting the chicken in your slow cooker the night before. Turn the chicken bones and skin into homemade chicken stock to make the enchilada sauce. Again, this can be easily done in the slow cooker. Texas Sheet Cake: A favorite at our family gatherings over the years. It will feed a lot of people and doesn't take much to make. Cream Cheese Stuff Strawberries: Wash some strawberries, cut them in an X, fill them with cream cheese filling and top it with a blueberry. It looks patriotic and tastes delicious! The 4th of July is a great day to celebrate with family and friends. 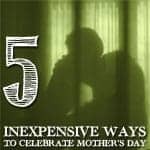 By choosing low cost, satisfying foods, having a frugal yet fun celebration is possible. What are your favorite frugal dishes to serve at parties or summer barbecues? A Child’s Religious Celebration: A Chance to Show Off? Why Do We Celebrate Our Independence On The Fourth Of July? Great tips! I’ve been checking out Pinterest for some creative DIY decorations and food inspirations. Great idea. There are so many suggestions on Pinterest. Did you find anything good? None that I tried, but I was definitely inspired. Thanks for some of the ideas. I can definitely scale back on how much I spend on Fourth of July. Great advice and thanks again!